DELAFIELD, Wis. (Stockpickr) -- I love to scan the markets for stocks that have the potential to go up a massive amount in a very short timeframe. Who wouldn't, right? It's not any easy thing to do, but when you've looked at as many chart patterns for as long as I have, it starts to become second nature. You start to see chart patterns and setups that work over and over again--or at least have a high probability of working. One of my recent finds that has blown even my expectations away is China-based health care player Dehaier Medical Systems (DHRM, which I featured in Jan. 16's "5 Stocks Under $10 Set to Soar" at $4.75 share. That chart was screaming at me when I found it, because DHRM was already in a strong uptrend and was setting up to break out into new 52-week-high territory. That's exactly what DHRM did, and as I type this the stock has tagged an intraday high today of $12.39 a share. That's a ridiculous gain of over 100% in just one month. Now, not all setups are going to work or produce explosive moves.. This is Wall Street, after all, and they don't like to make it easy for us. That being said, if you know how to locate high-quality setups, then you just have to wait for price and volume to confirm that a big move could be in the cards. With that in mind, here's a look at five stocks that could be setting up for explosive moves higher soon. One health care player to watch here is TearLabs (TEAR, which engages in developing and commercializing TearLab Osmolarity System, a proprietary in vitro diagnostic tear testing platform that measures tear film osmolarity for the diagnosis of dry eye disease. This stock has been destroyed by the bears over the last six months, with shares off sharply by 50%. 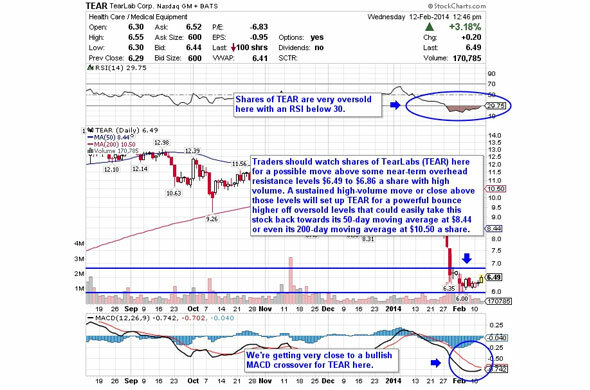 If you take a look at the chart for TearLabs, you'll notice that this stock has been downtrending badly over the last six months, with shares falling from its high of $15.18 to its recent low of $6 a share. During that downtrend, shares of TEAR have been making mostly lower highs and lower lows, which is bearish technical price action. That move has now pushed shares of TEAR into extremely oversold territory, since its current relative strength index reading is 30.78. Oversold can always get more oversold, but shares of TEAR are starting to perk up here and the stock could be setting up for a monster move higher. Traders should now look for long-biased trades in TEAR if it manages to break out above some near-term overhead resistance levels $6.49 to $6.86 a share with high volume. Look for a sustained move or close above those levels with volume that hits near or above its three-month average action of 566,432 shares. If that breakout hits soon, then TEAR will set up for a powerful bounce higher off oversold levels that could easily take this stock back towards its 50-day moving average at $8.44 or even its 200-day moving average at $10.50 a share. Traders can look to buy TEAR off any weakness to anticipate that breakout and simply use a stop that sits right below its recent low of $6 a share. One can also buy TEAR off strength once it starts to take out those breakout levels with volume and then simply use a stop that sits a comfortable percentage from your entry point. If youre looking for the next DHRM, then I suggest you take a hard look at Ariad Pharmaceuticals (ARIA, which focuses on the discovery, development and commercialization of medicines for cancer patients. This stock has been on fire over the last three months, with shares up sharply by 244%. If you take a look at the chart for Ariad Pharmaceuticals, you'll notice that this stock been uptrending strong over the last three months, with shares soaring higher from its low of $2.15 to its recent high of $9.83 a share with strong upside volume flows. During that uptrend, shares of ARIA have been making mostly higher lows and higher highs, which is bullish technical price action. Now that's a massive move already, but I think ARIA is just getting warmed up. This stock is starting to trend within range of triggering a major breakout trade that will give the stock a chance to re-fill some of its massive gap-down-day zone from last October that started near $19 a share. Traders should now look for long-biased trades in ARIA if it manages to break out above some near-term overhead resistance levels at $8.29 to $9.83 a share with high volume. Look for a sustained move or close above those levels with volume that hits near or above its three-month average action of 29.78 million shares. If that breakout triggers soon, then ARIA will set up to re-fill some of its previous gap-down-day zone that started near $19 a share. 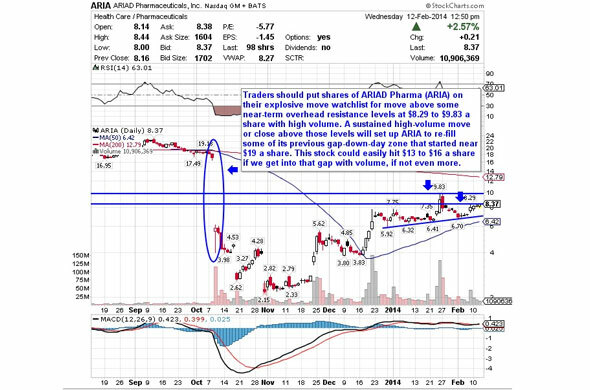 This stock could easily hit $13 to $16 a share if we get into that gap with volume, if not even more. Traders can look to buy ARIA off any weakness to anticipate that breakout and simply use a stop that sits right below its 50-day at $6.52 a share or near more key support at around $6 a share. One could also buy ARIA off strength once it starts to take out those breakout levels with volume and then simply use a stop that sits a comfortable percentage from your entry point. Another energy player that could be setting up for a monster move higher is USEC (USU, which engages in the supply of low enriched uranium for commercial nuclear power plants in the U.S., Japan and internationally. This stock has been annihilated by the sellers over the last six months, with shares off by 75%. If you take a look at the chart for USEC, you'll notice that this stock has been downtrending badly over the last six months, with shares plunging lower from its high of $29.12 to its recent low of $3.36 a share. During that downtrend, shares of USU have been making mostly lower highs and lower lows, which is bearish technical price action. That said, shares of USU have recent formed a double bottom chart pattern at $4.25 to $4.30 a share. This stock is now starting trend up a bit off those support levels and it's quickly moving within range of triggering a major breakout trade above a key downtrend line. Traders should now look for long-biased trades in USU if it manages to break out above some near-term overhead resistance levels at $5.19 to $5.40 a share and then once it takes out its 50-day at $5.77 to $5.89 a share with high volume. Look for a sustained move or close above those levels with volume that hits near or above its three-month average action of 671,350 shares. If that breakout triggers soon, then USU could easily explode to the upside since the stock is so beaten-down from its former highs. This stock could easily hit $7 to $9 a share very quickly if buyers start to step in. Traders can look to buy USU off any weakness to anticipate that breakout and simply use a stop that sits right below those double bottom support areas at $4.30 to $4.25 a share. One can also buy USU off strength once it starts to take out those breakout levels with volume and then simply use a stop that sits a comfortable percentage from your entry point. An alternative energy player that could be setting up for an explosive move higher is Plug Power (PLUG - Get Report), which engages in the design, development, commercialization, and manufacture of fuel cell systems for the industrial off-road markets worldwide. This stock has been exploding to the upside so far in 2014, with shares up a massive 142%. If you look at the chart for Plug Power, you'll notice that this stock has been uptrending over the last month, with shares moving higher from is low of $2.22 to its intraday high of $3.84 a share. During that uptrend, shares of PLUG have been consistently making higher lows and higher highs, which is bullish technical price action. 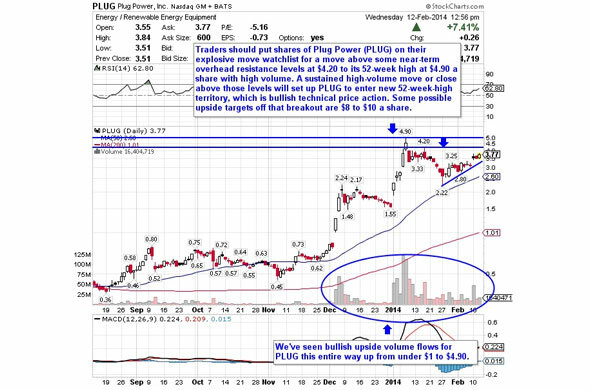 That move is now starting to push shares of PLUG within range of triggering a major breakout trade. This chart reminds me of DHRM's breakout right before it went on to trade up over 100%. Traders should now look for long-biased trades in PLUG if it manages to break out above some near-term overhead resistance levels at $4.20 to its 52-week high at $4.90 a share with high volume. Look for a sustained move or close above those levels with volume that hits near or above its three-month average action of 20.19 million shares. If that breakout hits soon, then PLUG will set up to enter new 52-week-high territory, which is bullish technical price action. 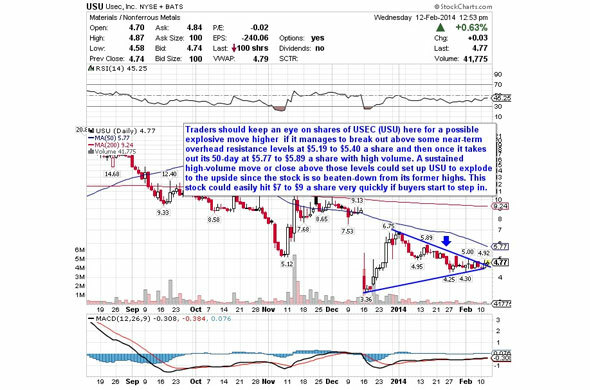 Some possible upside targets off that breakout are $8 to $10 a share. Traders can look to buy PLUG off any weakness to anticipate that breakout and simply use a stop that sits right around some near-term support at $3 a share or close to its 50-day moving average of $2.60 a share. One can also buy PLUG off strength once it starts to clear those breakout levels with volume and then simply use a stop that sits a comfortable percentage from your entry point. My final idea that could be preparing for a massive move higher is Skystar Bio Pharmaceutical (SKBI, which engages in the research, development, production, marketing and sale of veterinary health care and medical care products in the People's Republic of China. This stock has been in play with the bulls over the last six months, with shares up big by 167%. 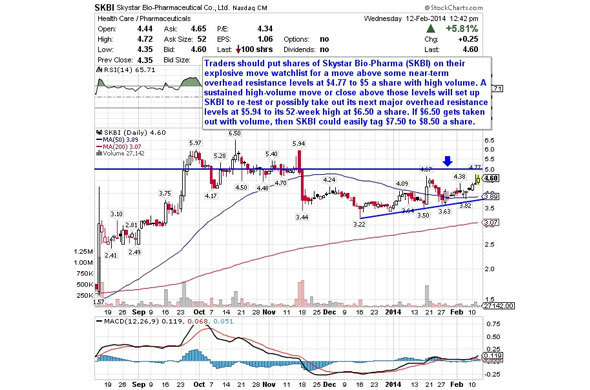 If you look at the chart for Skystar Bio Pharmaceutical, you'll notice that this stock has been uptrending strong over the last two months, with shares moving higher from its low of $3.22 to its recent high of $4.77 a share. During that uptrend, shares of SKBI have been making mostly higher lows and higher highs, which is bullish technical price action. That move is quickly pushing shares of SKBI within range of triggering a major breakout trade. Traders should now look for long-biased trades in SKBI if it manages to break out above some near-term overhead resistance levels at $4.77 to $5 a share with high volume. Look for a sustained move or close above those levels with volume that hits near or above its three-month average action of 76,215 shares. If that breakout triggers soon, then SKBI will set up to re-test or possibly take out its next major overhead resistance levels at $5.94 to its 52-week high at $6.50 a share. If $6.50 gets taken out with volume, then SKBI could easily tag $7.50 to $8.50 a share. Traders can look to buy SKBI off any weakness to anticipate that breakout and simply use a stop that sits right below its 50-day moving average of $3.89 a share. One can also buy SKBI off strength once it starts to take out those breakout levels with volume and then simply use a stop that sits a conformable percentage from your entry point. To see more stocks that could be setting up for monster moves higher soon, check out the Explosive Stock Watchlist portfolio on Stockpickr.